The Men's EHF EURO, the European Handball Federation's flagship national team event, takes a major step forward in its development with the 2020 event being the first one which is organised with 24 teams and staged in three countries. 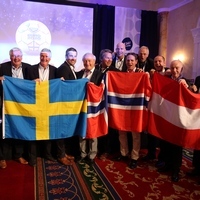 Sweden, Austria and Norway had jointly bid to host the championship and were awarded the right to host the event at the EHF Congress in Dublin on Saturday. "Feel welcome to a new dimension," said former Swedish international Stefan Lövgren at the beginning of the presentation. The three organisers plan to hold the championship in six different cities and venues and put the word out there that the EHF EURO 2020 Final will played in front of 24,000 fans in Stockholm's Tele 2 Arena, a multi-purpose stadium with a retractable roof. The six preliminary round groups shall be played in the Austrian cities of Vienna and Graz, the Norwegian city of Trondheim and the Swedish cities of Malmö and Gothenburg. The main round shall take place in Vienna and Sweden (either Malmö or Gothenburg), and for the finals the tournament shall move to the Swedish capital Stockholm. Venue capacities reach from 6,000 in the Graz Messehalle to 24,000 in the Tele 2 Arena in Stockholm. The Trondheim Spektrum arena in Norway is currently being built and will offer seats for approximately 8,000 spectators. The Stadthalle in Vienna can seat 12,000 people and so can the Scandinavium in Gothenburg. The Malmö Arena, which hosted the World Championship 2011 Final, has a capacity of 13,000. "We would like to prepare a championship where the we place handball in the focus and make sure that we get the best possible conditions for the players and the teams," is one of the application's key phrases.